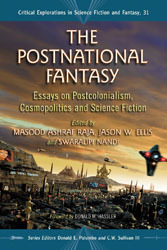 The Postnational Fantasy [read about the book and its contents here] is back in stock at Amazon.com here! Get yours today, or tell your library to place an order. You can also purchase it from the publisher McFarland & Co here, from Barnes & Noble here, or from Books-A-Million here. Many thanks to the folks who have already purchased a copy of my first book co-edited with my friends Masood Raja [please visit his Pakistan Forum and Postcolonial Space websites] and Swaralipi Nandi. I see on Amazon someone is already selling a used copy for $96 and $98! Collector’s items right out of the gate! Masood, Swaralipi and I should send an autographed copy to Southeby’s or Christie’s!